I started my fishing career in the neighborhood canals at age 7. At age 12, I bought my first boat, an 11’ Boston Whaler; this is when I broke out of the canals and start fishing in the ocean. Mostly fished kingfish and caught sailfish every once in a while. Then I upgraded to a 15’ Whaler, which I had a few different ones. This is when I started kite fishing in the winter months, and wreck fishing & running offshore for dolphin in the summer months. Once in my 15’ Whaler, Tim and I tried (yes I said tried) to fish the Ft Lauderdale Semi-Annual Sailfish Tourney and it was the October tourney……..big mistake…….it was so rough and had so much water in the boat that the Whaler was like sitting in a bathtub! We had to call it quits when the waterproof VHF got waterlogged!! I think this was the first tourney that we had ever fished and did not even complete it………we’ve come a long way and learned many things since then (mostly what not to do)! 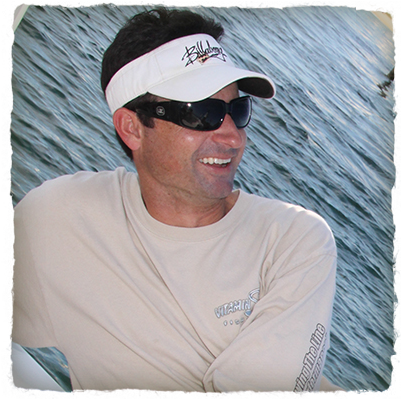 I also mated on sportfishing charter boats starting at age 16; I worked charter boats on weekends at the Cove Marina and Hillsboro Inlet Marina. I also worked on privately owned sportfishing boats fishing local tournaments, blue marlin tournaments in the Bahamas, blue marlin in St Thomas, and sailfish in Mexico, etc. I started to sell the extra fish that I caught, when fun fishing, to make a little extra money. Once I started college I needed a lot of extra money (beer can be expensive..…right! ), so I upgraded my boat to a 26’ Goldline and started commercial fishing on days that I did not have class (and class days if the fish were biting!). I stopped commercial fishing once I was out of college and got a “real” job, which a “real” job is not all that it’s cracked up to be; I would much rather be back fishing!! So that is what I am doing, back fishing tourneys with the team and the fun fishing in between; and yes, I also have to make time for that four letter word…….WORK! What else is there to say! !